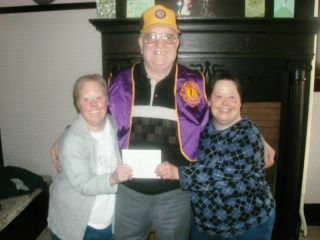 This week, the Horsham Lions Club put forward $320, to purchase Easter Dinners for eight local families in need. This yearly gesture to reach out to the community is repeated again at Thanksgiving and Christmas. Below is a picture of Horsham Lion John Campisi presenting a grocery voucher to one needy local family. Click on the photo for a larger image. The club also gave $150 toward the purchase of new eyeglasses for an underprivileged 12 year old resident with vision correction problems.